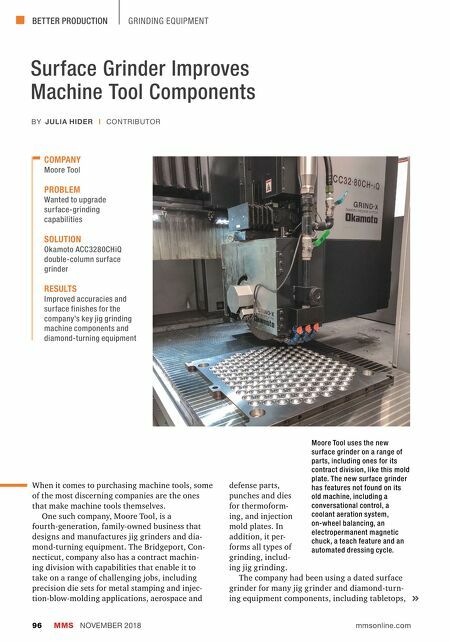 BETTER PRODUCTION MMS NOVEMBER 2018 96 mmsonline.com GRINDING EQUIPMENT Surface Grinder Improves Machine Tool Components When it comes to purchasing machine tools, some of the most discerning companies are the ones that make machine tools themselves. One such company, Moore Tool, is a fourth-generation, family-owned business that designs and manufactures jig grinders and dia- mond-turning equipment. The Bridgeport, Con- necticut, company also has a contract machin- ing division with capabilities that enable it to take on a range of challenging jobs, including precision die sets for metal stamping and injec- tion-blow-molding applications, aerospace and COMPANY Moore Tool PROBLEM Wanted to upgrade surface-grinding capabilities SOLUTION Okamoto ACC3280CHiQ double-column surface grinder RESULTS Improved accuracies and surface finishes for the company's key jig grinding machine components and diamond-turning equipment BY JULIA HIDER | CONTRIBUTOR defense parts, punches and dies for thermoform- ing, and injection mold plates. In addition, it per- forms all types of grinding, includ- ing jig grinding. The company had been using a dated surface grinder for many jig grinder and diamond-turn- ing equipment components, including tabletops, Moore Tool uses the new surface grinder on a range of parts, including ones for its contract division, like this mold plate. 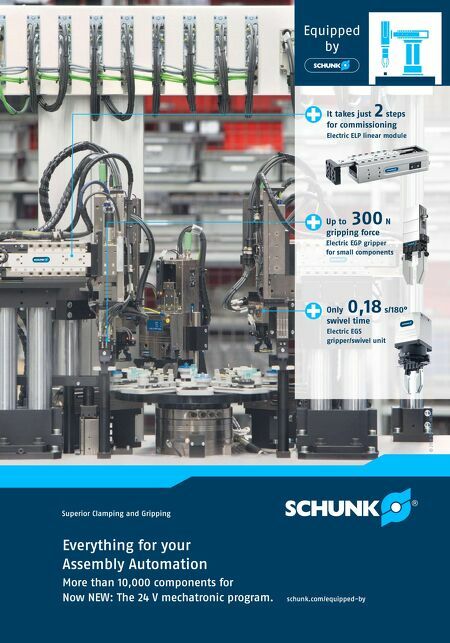 The new surface grinder has features not found on its old machine, including a conversational control, a coolant aeration system, on-wheel balancing, an electropermanent magnetic chuck, a teach feature and an automated dressing cycle.